Arctic Haven – Caribou, Wolves and Northern Lights – The Great Canadian Travel Co.
One of the best northern wildlife photography programs around. Witness the colours of the changing seasons, experience the caribou migration as they head south to their winter home, watch for wolves and the Northern Lights above. Prices shown are in CA$, per person based on two people sharing a twin room. Single rooms may be accommodated on request, depending on availability, as the lodge only has 12 rooms. Your visit to Arctic Haven Lodge is from Friday to Friday. You arrive on a Friday morning and depart Arctic Haven the following Friday afternoon. In the early afternoon, at the airport in Yellowknife, Arctic Haven guests meet the private charter plane that will fly them the 500 miles to Arctic Haven Wilderness Lodge. The baggage allowance for the charter flight from Yellowknife to Arctic Haven is 44 lbs (20 kg) per person which includes a carry-on. Please let us know if you will have additional gear, such as photographic equipment. Your wallet is no longer of any use, your worries from the south are behind you, this is the start of your Arctic adventure. The plane is a modern and comfortable aircraft, either a Dash-8 38-passenger turbo-prop, a Dash-7, 40 passenger aircraft or a Dornier 228, 19 passenger turbo-prop. You will pass from trees, across the tree line and over the Barren Lands; it’s time to sit back and relax. Flying to Arctic Haven, you’ll see the Barrens from the air; the endless lakes and caribou paths forged into tundra, the sparse trees dotting the tree line amidst a fall backdrop of crimson reds, bright oranges and dark greens. The plane lands on the private strip beside Arctic Haven Wilderness Lodge. Nestled on the tree line, Arctic Haven is situated on the shores of one of the largest expanses of water on the Barrens, the eighty-four kilometre long Ennadai Lake. Guests are welcomed into the lodge, a short introduction is given and guests are given the opportunity to settle into their private rooms. Ennadai is a remote lake located 700 kilometres east of Yellowknife and 150 kilometres north of the Manitoba-Nunavut border in the barren lands of the Canadian Arctic. The lodge is on the tree line; go north and there are no trees, go south and it quickly becomes forested, a location rich in wildlife. The lodge is in the path of one of great caribou migrations; the Qamanirjuaq caribou herd of more than 300,000 animals. Every fall, the caribou go south into the trees for the winter, and each spring they head north, many of them walking up Ennadai Lake to their calving grounds. Wolves and wolverines are plentiful. There are also barren land grizzly bears, black bears, and many types of birds, including tundra swans, golden eagles, jaegers, and more. The lake holds trophy size lake trout, northern pike and grayling. At different times of the year, it is possible to catch all these fish on a fly rod. The lodge is fortunate to be located at the just the right latitude for great northern lights. The lodge is a beautiful post and beam structure with 12 guest rooms, each with a full private bathroom. During the summer of 2013 a solar system was installed so that the use of generators is almost eliminated. The staff are passionate, professional, expert and very caring. And the food is incredible, including local foods such as musk-ox and Arctic char. Every day starts with fresh hot muffins and ends with a hot shower and a glass of wine! After dinner, guests are welcomed to walk the surrounding tundra, where numerous caribou trails can be explored in solitude. For those looking to relax and unwind, we are proud to offer a wood-fired sauna on the shore of our lake for your comfort and enjoyment. For the keen fisherman, or avid learner, great trout fishing can be enjoyed just a short walk from the lodge. Breakfast, served at 8:30, typically includes fresh espresso coffee, home-baked pastries, muffins, cinnamon rolls, fresh fruit, yogurt, muesli, French toast or pancakes with Quebec maple syrup, eggs, organic double-smoked bacon and sausages. Guests are given an introduction prior to heading out onto the waters of Ennadai Lake by boat. Arctic Haven has three twenty five foot enclosed custom boats as well as a fleet of smaller boats. These boats are used on a daily basis as our mode of transportation to find and view caribou, to explore the far reaches of the lake and to arrive to locations where great hiking and panoramic views of the Barren Lands can be enjoyed. Today’s excursion explores the northern reaches of Ennadai Lake. It is here above the tree line that caribou can be found on islands and shorelines. This trip features great views, photographic opportunities and even the unique experience of tracking and viewing caribou from the land. Majestic bulls can be seen on the shores, grazing and slowly making their way south. Females and calves can be seen cautiously moving across the tundra. A lunch spread of soup, gourmet meats and cheeses, hummus and vegetables, and fresh-baked bread and sweets is served by your guides on the unique and picturesque beach on Paradise Island. The afternoon is spent cruising amongst the islands to spot caribou with short walks on land to view them closer. The full day of adventure stirs up an appetite. Our chef greets guests from a day of adventure on the Barren Lands tundra with a Canadian gourmet meal. Flavours include AAA Alberta prime rib glazed with a Dijon, garlic and rosemary rub; radicchio, prosciutto and reduced maple-balsamic appetizers rolls, fresh arugula and blueberry salads with desserts such as maple creme brûlée. In the evening, Richard Weber, internationally recognized polar explorer and owner of Arctic Watch, offers an informal lecture on his North Pole adventures. His historic 1995 unassisted journey to the North Pole and back—a feat that has never been repeated —is highlighted. We begin today’s adventure with a short, 20-minute boat ride to arrive at the shoreline where our hike to the Blind Hill esker begins. This 9-kilometre hike takes you from the soft and wet blueberry flats to a dry and well-worn caribou trail on the spine of an esker, to an open tundra ridge overlooking the lakes and land below. The eskers are remnants of the great glaciers that covered this land in the last ice age. They are unique sandy ridges and hills that were deposited by the rivers flowing beneath retreating and melting glaciers. 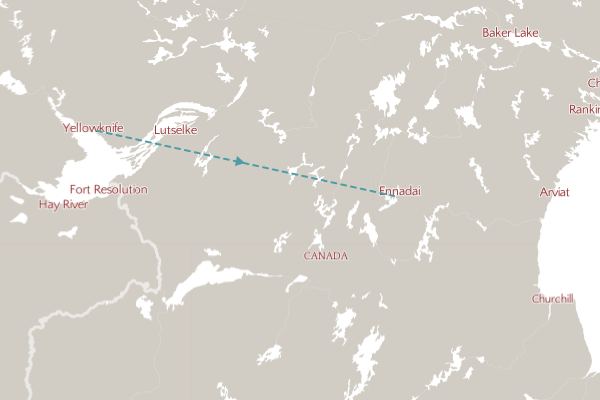 The ease of travel on eskers make them an ideal migration route for caribou. With your guides interpreting the flora along the way, the hike makes its way to a sheltered forest gully where another gourmet lunch spread is prepared for you. The hike continues over rolling terrain to a high point where an Inuit stone hunting blind still sits on the ridge above the tundra below. An observer on top of the esker can look northward and see treeless Barrens or look south and see the dark green of the boreal forest. This is the tree line. As we make our way across the high ridge, lakes and rivers and tundra can be seen below, amongst the blanket of vibrant autumn colours. various types of berries carpet the ground; blue berries, lingo berries, crow berries and more. We re-enter the black spruce forest and esker paths before ending our hike on the blueberry flats near the lake. Here you are more than welcome to harvest blueberries which our chef will be happy to incorporate into our meals and baking. An alternative option to hiking today is a fishing trip at Richard’s shoal and Grayling Rapids. At the shoal, trout like are abundant and Grayling Rapids offers an opportunity to fly fish for grayling. Both experienced and new fisherman are provided with equipment and accompanied by expert guides. The shallow waters of the rapids spilling into the lake and the narrow crossing point of land make for the perfect location for a convergence of wildlife. The caribou trails dig deep into the tundra and caribou frequent this crossing point. Guests who wish to try their hand at fishing for Arctic Grayling, either on a fly or spinning, have the opportunity to do so. No prior experience is required, some love the way a winged Arctic Grayling will treat a well-presented fly. Others are fascinated by its rarity and appearance. Either way, this fish provides ample action for a great light tackle experience. The full day excursion is complemented by a gourmet meal that awaits guests upon arrival. Arctic Haven’s chef focuses on local flares to the evening dishes, including fresh arctic lake trout gravlax. The Arctic Haven wine list offers some of Canada’s best wines, paired to match the local dishes. This evening, a presentation on the Ahiarmiut of Ennadai Lake will shine light on the history and culture of the Inuit people who once called the lake home, hunting from kayak, living off the land and subsisting almost entirely on caribou. Several thousand Inuit once lived along the shores of Ennadai Lake and the surrounding area. This population was reduced to forty-five people by the mid-1950’s; a result of starvation and disease, when the Ahiarmiut were tragically relocated from their homeland to coastal communities. Another hearty breakfast begins the day at 8:30. Today we board our boats and head to the North Arm exploring the far reaches of our lake where caribou are most frequently seen. As we enter the North Arm we begin to cruise the shorelines, looking for caribou either on land or swimming between the islands. Our lodge has a remote camp in this part of the lake and staying a night is an option, as it will give you the opportunity to thoroughly enjoy the remoteness of the Barren Lands. Here we dine on another great picnic spread and guests are free to explore the island, perhaps even catching a glimpse of caribou on nearby islands. Our day includes a short hike up to Big Bear, the highest point on the lake. The terrain is quite different from the rest of the lake; here the bedrock is exposed and round rocks have been placed on top by glaciers. From the summit, a truly awe-inspiring panoramic view is enjoyed and guests are given time to explore, relax and take in the scenery in solitude. We embark the boats yet again in search of more caribou, which if given the opportunity, we will try to stealthily approach from land to get a better view. This evening, after another spectacular meal, photographer Nansen Weber, offers an informal lecture on his photographic experiences on the Barren Lands. The principal photographer at Arctic Haven and Arctic Watch Wilderness Lodge, Nansen has spent the past 10 years photographing some of the most important and dramatic wildlife events in the arctic. 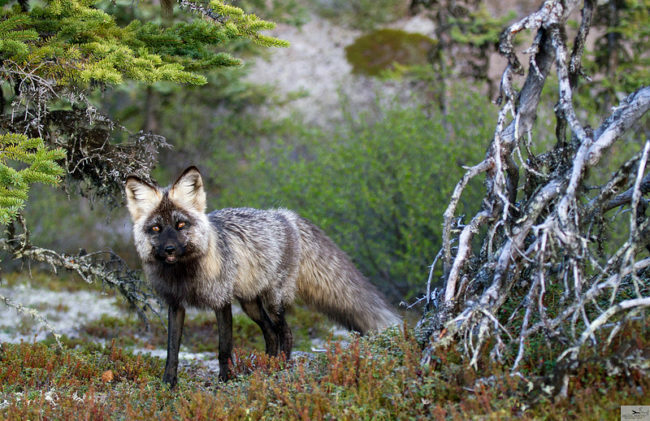 He highlights his presentation with local photography – both of wolves and caribou. The pace today is relaxed and all about taking in the surroundings and everything the islands have to offer. There is something for everyone! After returning to the lodge and enjoying another healthy and hearty meal, we invite you to attend a short informal presentation on the Mythology and Folklore of the Aurora Borealis. This talk is a labour of love and inspired by stories from around the world about the northern lights and their relation to the living on land. If its a clear night, your evening could come to a close gazing out above the lake at the majestic aurora. Today’s adventure necessitates a gourmet breakfast to start, served at 8:30. Heading south into the tree line, today’s excursion starts with a short boat ride up the Kazan River – one of the largest rivers on the Barrens. Here, the tundra begins to turn into forest – birch, black spruce and tamarack trees lay claim to the territory, with caribou trails weaving amongst the sparse yet impressive arctic forest. Moose have been seen in this forested and marshy area as well. This location is also excellent for tundra swans; the majestic Arctic swans nest on the edge of the river bank, in small grassy openings. This area was burnt by natural forest fire some years ago. Now the new growth is clearly visible all around. For the more adventurous, there is a spectacular 7 km walk along the eskers, following caribou, moose and wolf tracks that takes us back to Birch Bay on Ennadai Lake. The walk normally takes about four hours. For those who want to walk less, a short walk amongst the forested eskers bring us to the final paths of the Qamanirjuaq caribou – only a few miles south from here they overwinter. Have your camera ready! Wolves have been seen here in the past and a den is strategically placed near one of the eskers. After lunch, guests are given the opportunity to try a final hand at fishing for arctic grayling. The swift current of the Kazan is an excellent location for the species. Near-to world record grayling has been caught in these waters! After dinner guests are welcome to join Arctic Haven guides for catch-and-release arctic lake trout fishing. The shallow beach on the shoreline in front of Arctic Haven is excellent for lake trout at sunset. That evening, for the foodies at heart, Josée Auclair, co-owner of Arctic Watch & Arctic Haven, provides an informal cuisine class. At Arctic Haven, everything is prepared fresh and homemade from bread to ice cream. All the meat is organic. On the tundra are edible wild foods. There is also a seminar of cleaning and filleting fish. As always, we are happy to fire up the sauna for those interested in relaxing by the lake. Today is the last opportunity to take in the northern lights! Cozy up in a blanket on the front deck Muskoka chairs and enjoy a glass of fine Canadian wine as the lights begin their show. By their last day in the Barren Lands, guests are familiar with the area of Ennadai Lake and Arctic Haven Lodge. Today we offer a short hike following the caribou trails on the esker near the lodge. Wolf and caribou tracks can be followed in the sandy paths and beautiful shimmering ponds are seen through the black spruce forest. We return to the lodge for a hearty lunch and guests are free to relax for the afternoon before the plane arrives. We are proud to offer a final and unique Arctic experience; homemade tea and bannock – a staple food of the Arctic. The tea is infused with fresh, fragrant and local Labrador Tea and the bannock is freshly baked and served with blueberry jam, honey and butter. In the late afternoon, the plane will arrive to take guests back to Yellowknife where the Arctic Haven program ends. You can choose to spend some time visiting Yellowknife or catch a flight south. Add a stay in Yellowknife pre or post tour, or both! We can put together a package of accommodation and tour options for you. Recommended Packing List: Proper preparation for a trip to the Arctic is key to your enjoyment and safety. Please take a few moments to read through the gear list below. If you have any questions please contact us and we’ll be happy to provide you with the answers and information you need. NEOPRENE BOOTS: These are a new option to the traditional “rubber” boot. They have neoprene uppers and a neoprene/polyurethane foot. There is no insulation to get wet and they are comfortable to walk in. One of the best brands is Muck Boots, but there are other options available at outdoor stores or online. HIKING BOOTS: A sturdy full-leather waterproof/water-resistant pair of comfortable lightweight boots is useful but can be replaced with the neoprene boots. LIGHT WINTER JACKET OR DOWN VEST: Again for cooler evenings. (Yes, even in 24-hour light the nights are colder.) A warmer jacket is essential. COMFORTABLE PANTS FOR HIKING: A couple of comfortable pairs of pants are useful. Try to choose “quick dry” fabrics made from tightly woven, wind-resistant material. No cotton or silk content please. LONG UNDERWEAR: It is the Arctic, so bring a couple of sets of long underwear. Synthetic or wool material, no cotton or silk content please. In the winter, spring and fall you will need long underwear. The temperature can vary greatly. Winter (April) expect -20°C (-4°F) at night to +5°C (41°F) in the day. Spring and fall (May, June Aug, Sep) expect -2°C (28°F) to +20°C (68°F). Summer (June, July) expect +5°C (41°F) to +25°C (77°F). DAY PACK: You need this to carry your extra things, e.g., a camera and clothing, while on a day’s outing such as walking, sea kayaking, fishing (with waterproof storage compartments) or when travelling in our boats. We recommend Osprey Backpacks or similar. PERSONAL ITEMS: Bring your toiletries, camera, sunglasses and other personal items. FISHING: If you enjoy fishing and prefer your own gear, please bring it. RAINCOAT AND RAIN PANTS: This is primarily for protection against the wind and rain A rain/wind jacket is a necessity to wear when walking on cool days. Your jacket must be waterproof and seam-sealed. We recommend goretex coats such as Arcteryx Alpha SV or equivalent. LODGE SHOES: Light shoes for wearing around the lodge are useful. For those who enjoy a morning jog/walk, bring your trail shoes. Nearby caribou trails offer great opportunities for exploration on foot. FLEECE JACKET: A fleece jacket is always useful and good for wearing around the lodge. HAT: A wool toque (cap) or fleece hat made of a material that dries easily is necessary. GLOVES: Gloves or mittens with a wind-resistant outer fabric are good for cold days or those ATV rides. SOCKS: A few pairs of good wool or wool-synthetic blend socks are essential. Remember that socks are small to pack and wonderful to wear! We have Smartwool socks available for sale. (No cotton or silk please). SUNSCREEN: The summer sun at Arctic Haven is extremely strong – we recommend packing sunscreen. GEAR AVAILABLE AT ARCTIC HAVEN: We have the following gear available for you to use when doing the applicable activity: ATV helmets, fishing gear, paddling dry jackets and pants, life jackets (PFDs) and more. If you have specific gear questions, please ask and we’ll find the information for you. ALCOHOLIC BEVERAGES: Alcohol is available for purchase at the lodge. If you wish to bring any alcoholic drinks of your own, please do so as it’s your vacation. We just ask that you respect the other guests. Come and witness the natural spectacle. In May, the Qamanirjuaq caribou herd begins to gather together and the call to reach their calving grounds 300 miles to the north drives them northward. Big lakes such as Ennadai are natural corridors for the migration. Large numbers of Caribou walk up the lake past the lodge. Travel by snow mobile in search of the herds and the Arctic wolves that follow the caribou. This grand migration is described as a life-altering experience by the caribou biologists and people who have witnessed it. We regularly see wolverine, which are normally very elusive. We look for the Arctic wolves that follow the caribou. Staying at Arctic Haven Wilderness Lodge, a “green” lodge that runs on solar and wind power, the only one of its kind in Nunavut, daily experiences are offered to witness the great migration. Different times of the year provide better photography opportunities as they’re a different time in the Caribou’s developmental stages. Ask to speak to one of our Arctic Specialists and we’ll be able to help you decide which departure will suit you best.